Turnips! Love them or hate them? I love them from root to leaf. Combine them with preserved lemon and quickly roast them, I am in veggie heaven. 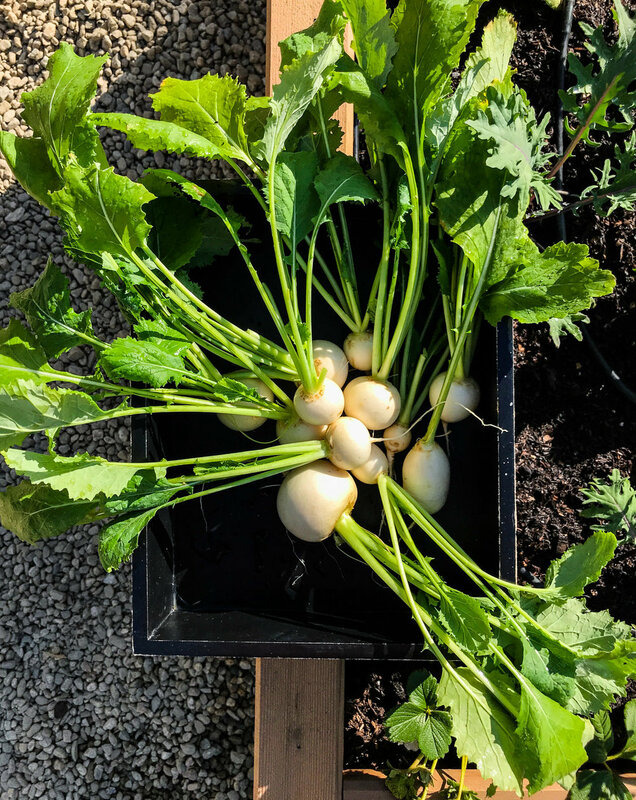 The easy to grow Shogoin turnips are in our fall and winter garden. They are fast growing and so mild in flavor they can be eaten raw. My favorite way to eat these little gems is to trim off the leaves, saving them for salad, and quickly roast the turnips. Roasting gives root vegetables a nice sweet flavor. 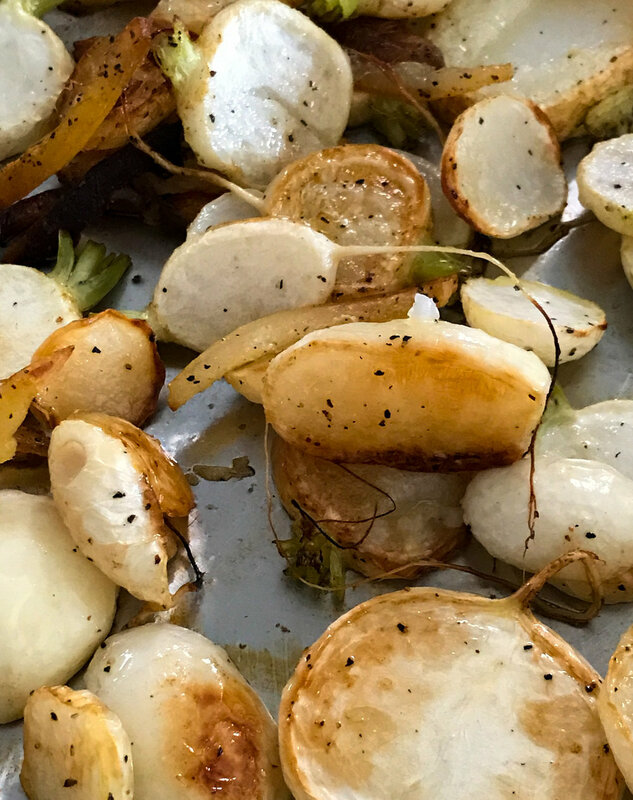 Learn this method of roasting turnips and you can use it to for any root veggie. I incorporate Preserved Lemons, I started last month, to add a salty fermented bite. If you don't have the preserved lemon on hand, thinly sliced lemon peel without the pith works well too. I use this same method to roast carrots, parsnips, rutabagas and even the humble potato. Wash turnips and greens. Separate the leaves from the turnips, leaving the leaf ends attached to the turnips. Reserve the greens for salads or a stir fry. Slice the turnips into 1/4 inch slices. Put slices into an oven proof skillet or on a baking pan. Drizzle on an ample amount of olive oil. Sprinkle with salt and pepper. Use 1/4 of a preserved lemon. Prepare the preserved lemon by washing it and removing the meat of the fruit. Slice in thin lengths and throw on top of the turnips. Use your hands to toss the olive oil, salt and pepper and preserved lemon evenly around the turnips. Put in oven for 30 minutes. Stir halfway through. Use as a side dish or a perfect addition to a rice bowl. You can find Shogoin Turnips at Sow True Seed, if you want to try growing them yourself.